I added an answer on Quora but I think there can a a discussion on this. So here it is (embedded). Feel free to let me know what you think. 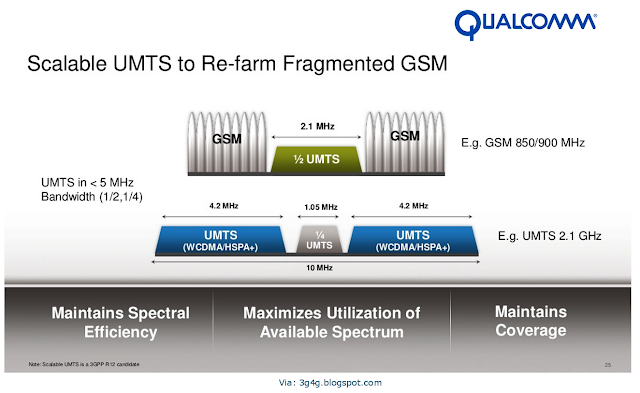 Came across Qualcomm's HSPA+ Carrier aggregation video (above) and whitepaper. 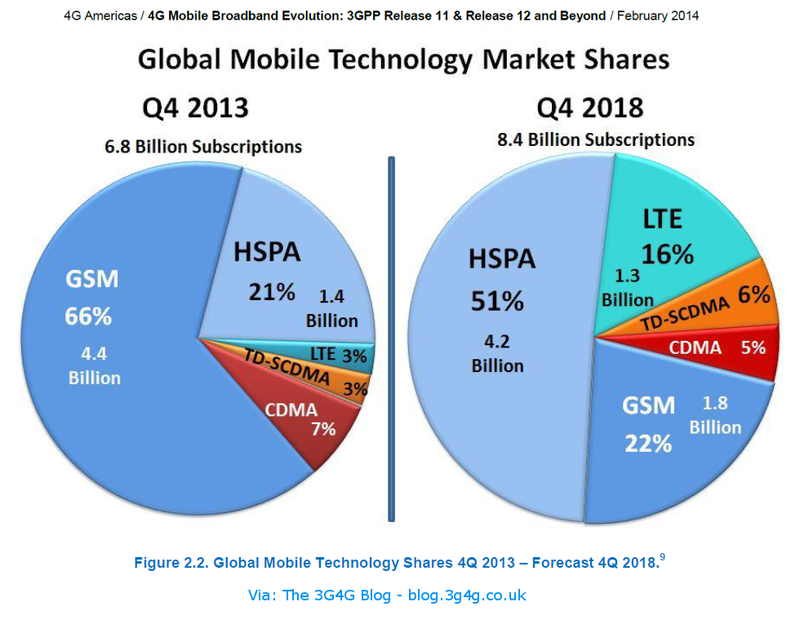 Interesting to see that HSPA/HSPA+ is still growing. 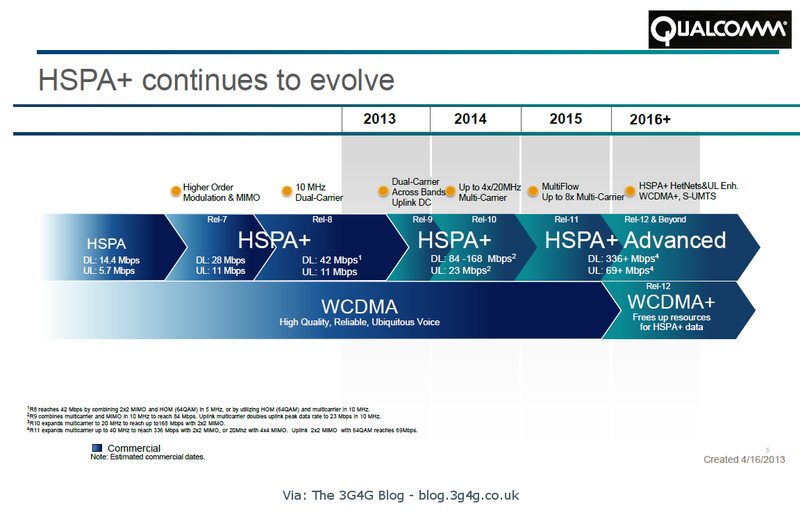 As per my earlier post, half of the connections in 2018 would be HSPA/HSPA+. As can be seen in the picture above, there are quite a few features that may be of interest to the operators. Scalable UMTS is one such feature as I have put in the blog before. You will notice that upto 4 bands can be aggregated. It would be interesting to see which operators have these bands available and if they would be willing to use HSPA+ CA with upto 4 bands. The presentation by Qualcomm is embedded below and is available to download from here. A recent GSMA report suggests that China will be a significant player in the field of 4G with upto 900 million 4G users by 2020. This is not surprising as the largest operator, China Mobile wants to desperately move its user base to 4G. 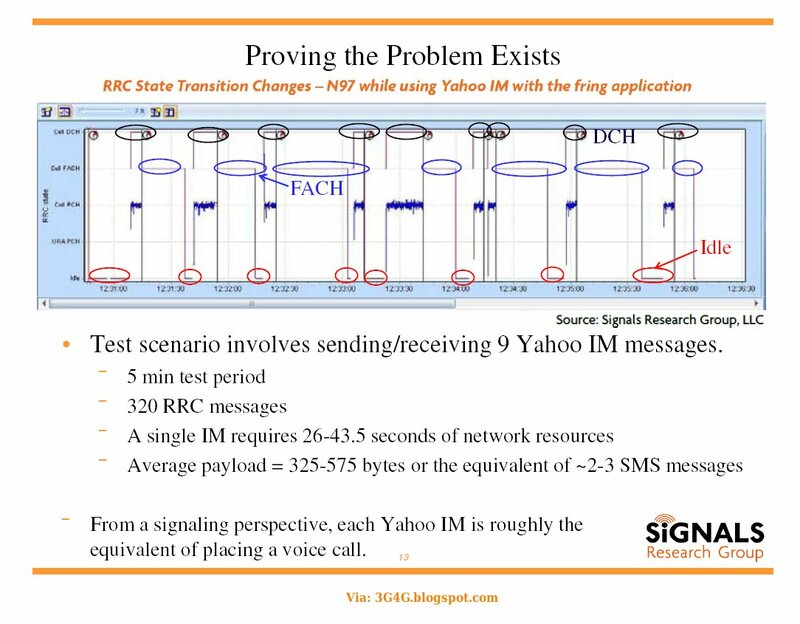 For 3G it was stuck with TD-SCDMA or the TDD LCR option. This 3G technology is not as good as its FDD variant, commonly known as UMTS. This trend of migrating to 4G is not unique to China. 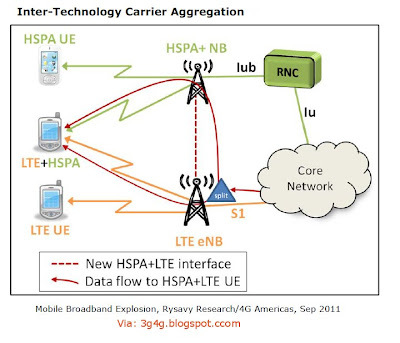 A recent report (embedded below) by 4G Americas predicts that by the end of 2018, HSPA/HSPA+ would be the most popular technology whereas LTE would be making an impact with 1.3 Billion connected devices. 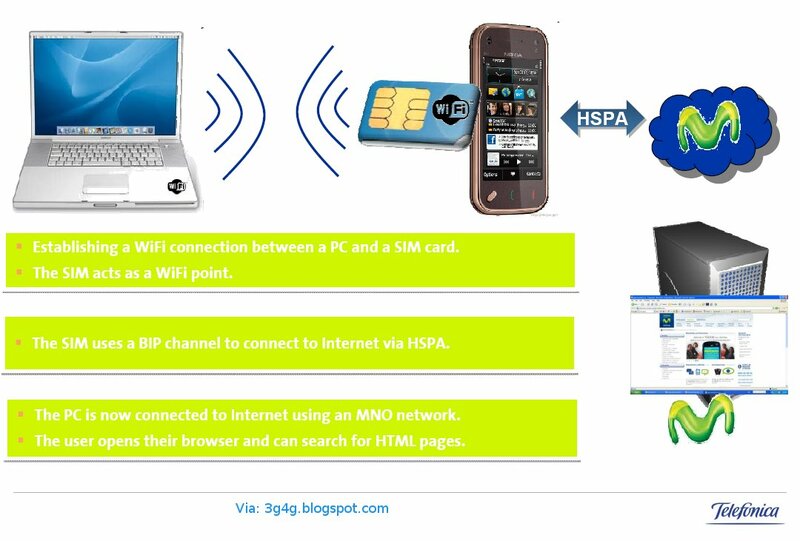 The main reason for HSPA being so dominant is due to the fact that HSPA devices are mature and are available now. LTE devices, even though available are still slightly expensive. At the same time, operators are taking time having a seamless 4G coverage throughout the region. 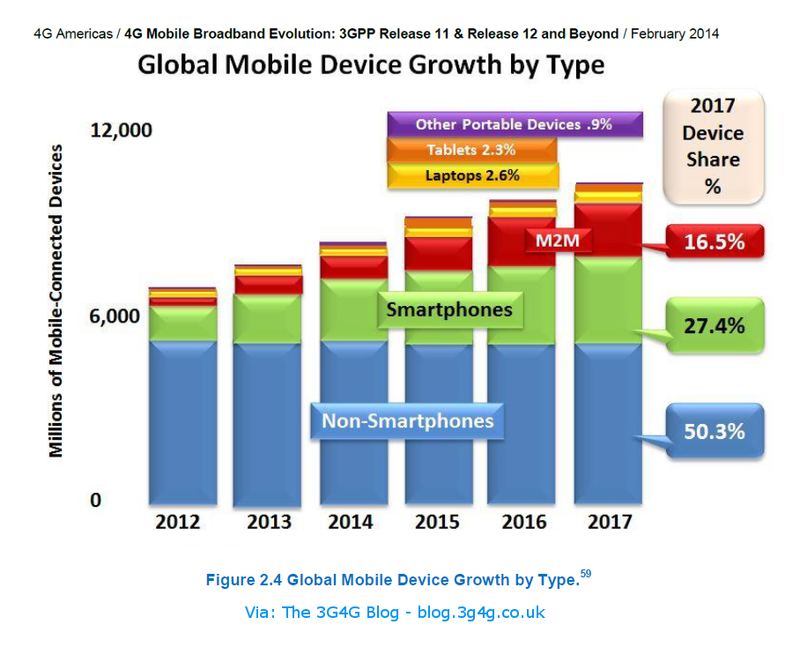 My guess would be that the number of devices that are 4G ready would be much higher than 1.3 Billion. It is interesting to see that the number of 'Non-Smartphones' remain constant but at the same time, their share is going down. It would be useful to breakdown the number of Smartphones into 'Phablets' and 'non-Phablets' category. 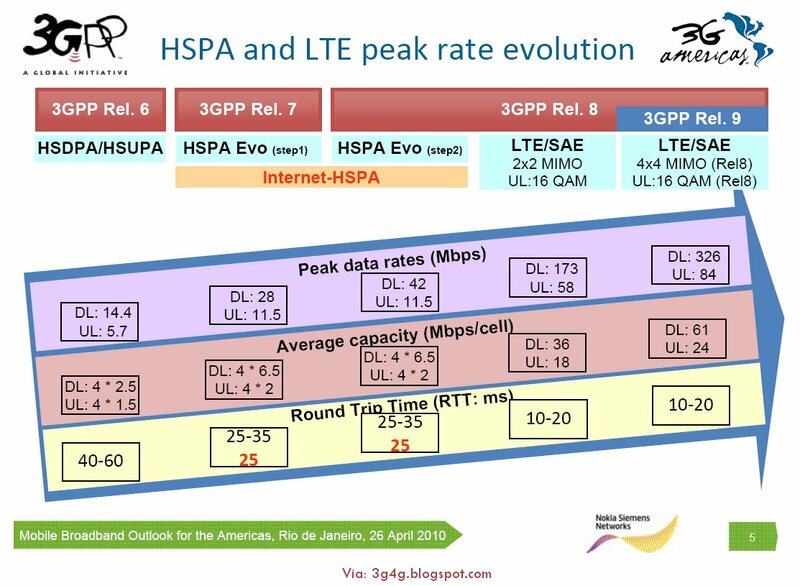 Anyway, the 4G Americas report from which the information above is extracted contains lots of interesting details about Release-11 and Release-12 HSPA+ and LTE. The only problem I found is that its too long for most people to go through completely. Work in Rel-12 also included features for network and services enhancements for MTC, public safety and Wi-Fi integration, system capacity and stability, Web Real-Time Communication (WebRTC), further network energy savings, multimedia and Policy and Charging Control (PCC) framework. Merged various slides from the recent 4G Americas presentation to get a complete picture of data throughput speeds for various technologies. Mobile Broadband Speeds: How is 4G different from 3G? 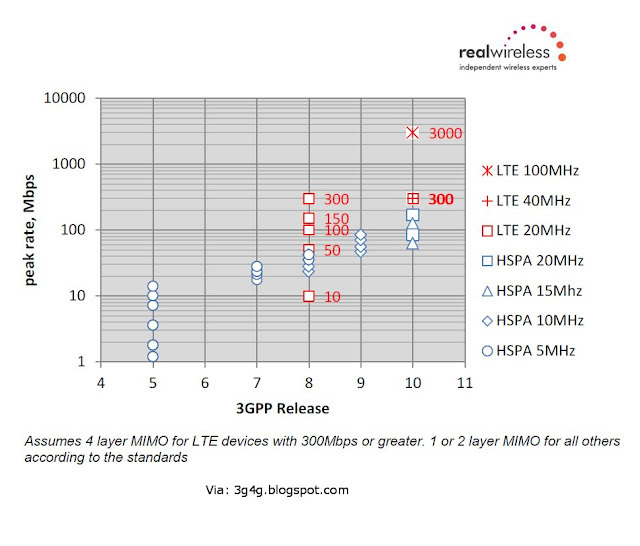 Interesting report to remind the differences between HSPA and LTE available here. HSPA based mobile internet offerings are becoming very popular and data usage is increasing rapidly. As a result, HSPA has begun to be deployed on more than one transmit antenna and/or on more than one carrier. 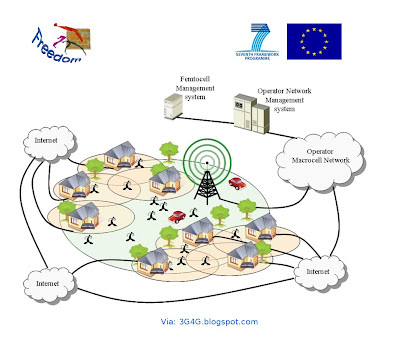 As an example, the single cell downlink MIMO (MIMO-Physical layer) feature was introduced in Release 7. This feature allowed a NodeB to transmit two transport blocks to a single UE from the same cell on a pair of transmit antennas thus improving data rates at high geometries and providing a beamforming advantage to the UE in low geometry conditions. 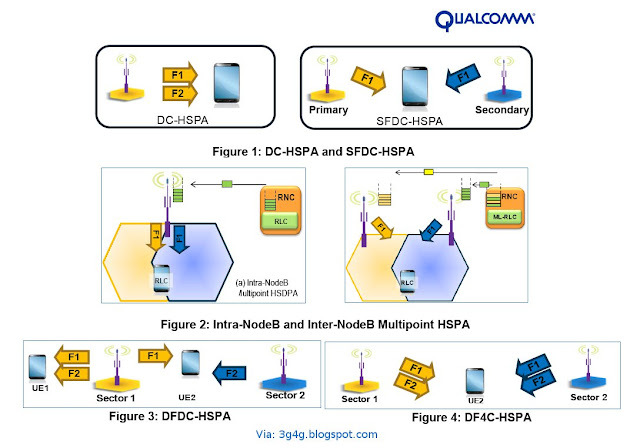 Subsequently, in Release-8 and Release-9, the dual cell HSDPA (DC-HSDPA) and dual band DC-HSDPA features were introduced. 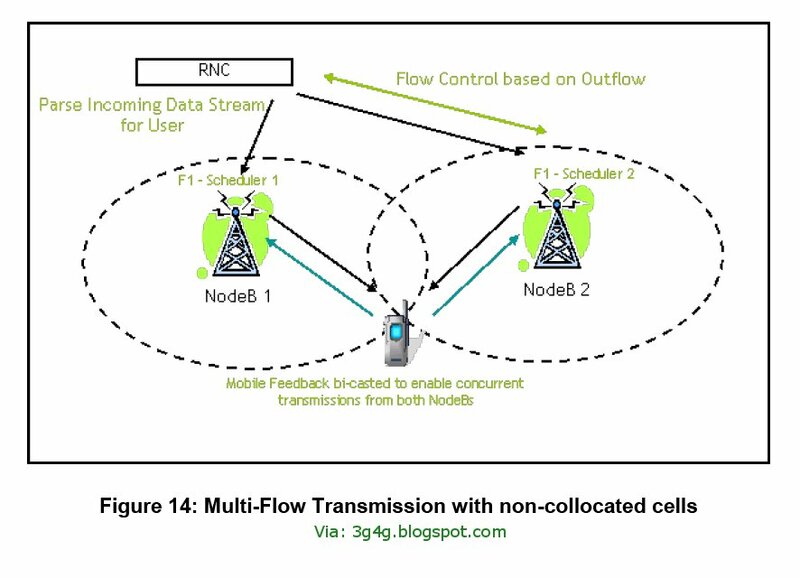 Both these features allow the NodeB to serve one or more users by simultaneous operation of HSDPA on two different carrier frequencies in two geographically overlapping cells, thus improving the user experience across the entire cell coverage area. 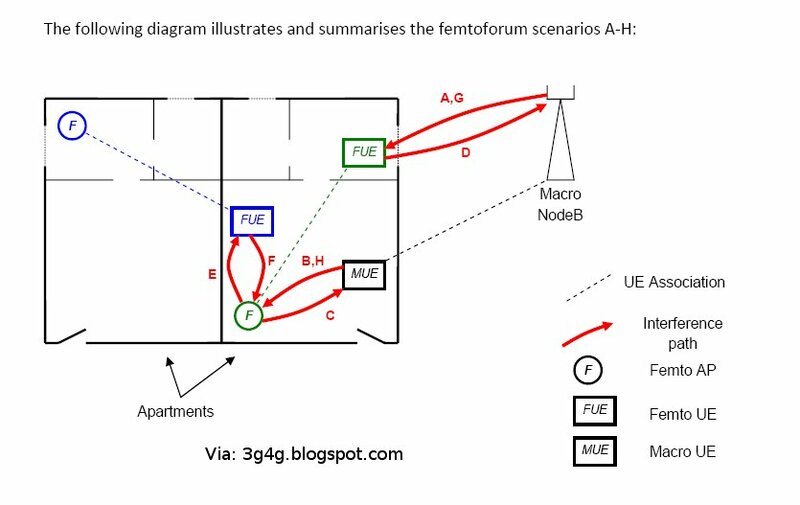 When a UE falls into the softer or soft handover coverage region of two cells on the same carrier frequency, the link from the serving HS-DSCH cell is capacity or coverage limited and the non-serving cell in its active set has available resources, it would be beneficial to schedule packets to this UE also from the non-serving cell and thereby improve this particular user’s experience. One family of such schemes parses the incoming data for the user into multiple (restricted to two cells in the study) data streams or flows, each of which is transmitted from a different cell  Concurrent transmission of data from the two cells may either be permitted or the UE may be restricted to receiving data from only one cell during a given TTI. The former type of scheme is designated an aggregation scheme while the latter is termed a switching scheme. 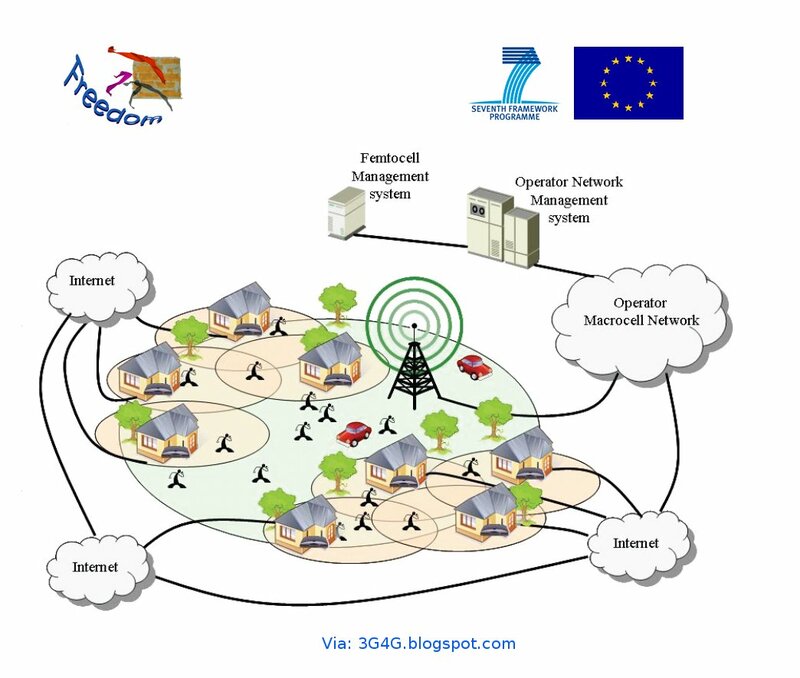 The aggregation scheme can be seen as subsuming the switching scheme at the network when scheduling to the user is restricted to the cell with better channel quality. 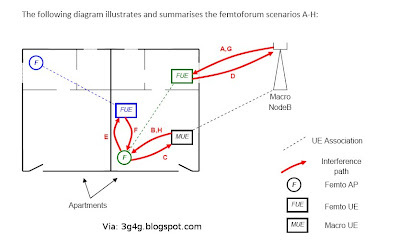 Figure 14 illustrates the basic multi-flow concept with both cells operating on the same carrier frequency F1. 3GPP studied different multipoint transmission options for HSDPA and documented the findings and performance gains in TR25.872 providing feasibility and performance justification for the specification work. 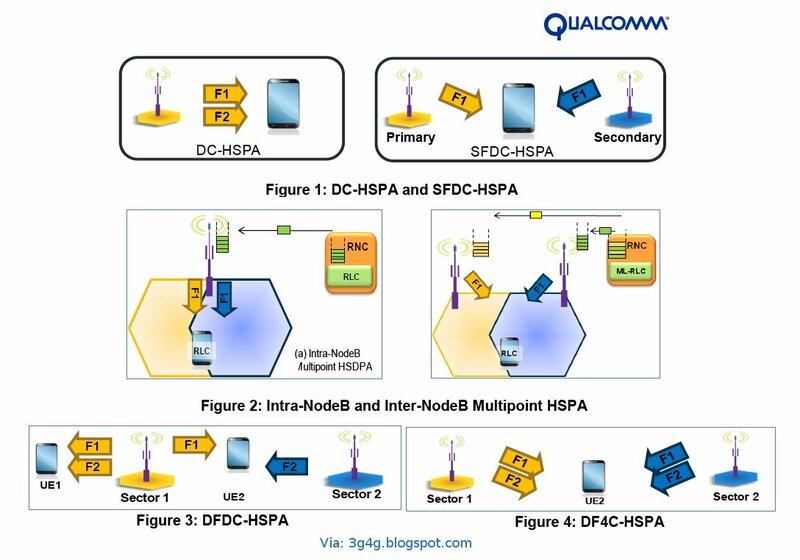 See also old blog post on Multipoint HSDPA/HSPA here. HSPA Release 10 with 4-carrier HSDPA provides a peak downlink data rate of 168 Mbps using 2x2 MIMO (Multiple Input Multiple Output) over the 20 MHz bandwidth. This matches the LTE Release 8 data rates obtained using comparable antenna and bandwidth configurations. A natural next step for the HSPA Release 10 downlink is to further extend the supportable bandwidths to 40 MHz with 8-carrier HSDPA, doubling the Release 10 peak rate to 336 Mbps. 8-carrier HSDPA coupled with 4x4 MIMO doubles the peak rate again to reach 672 Mbps, see Figure 1. 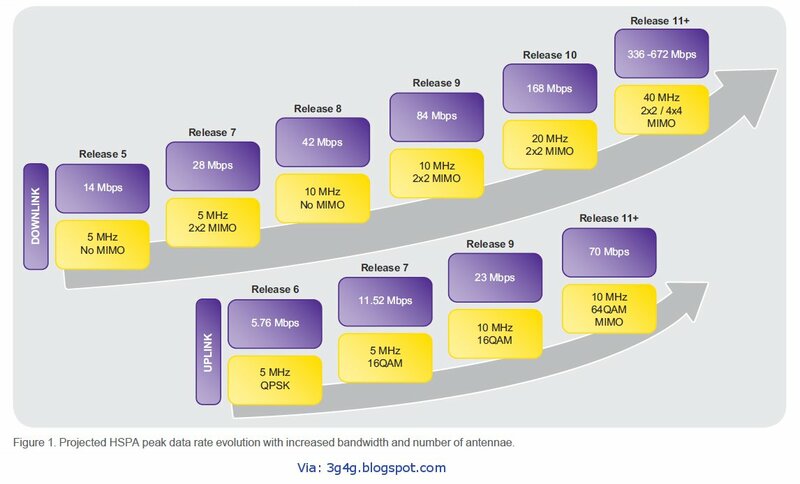 The evolution of HSPA beyond Release 10 will push the peak data rates to rival those provided by LTE Advanced. In addition to increased peak rates, the aggregation of a larger number of carriers improves spectrum utilization and system capacity owing to inherent load balancing between carriers. Additional capacity gains from trunking and frequency domain scheduling will also be seen. Typical spectrum allocations do not provide 40 MHz of contiguous spectrum. 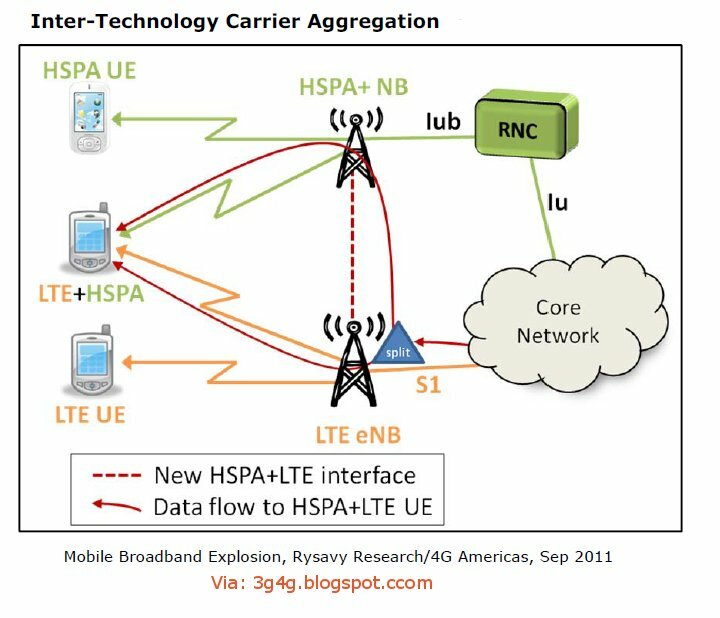 To overcome spectrum fragmentation, HSDPA carrier aggregation allows carriers from more than one frequency band to be combined. 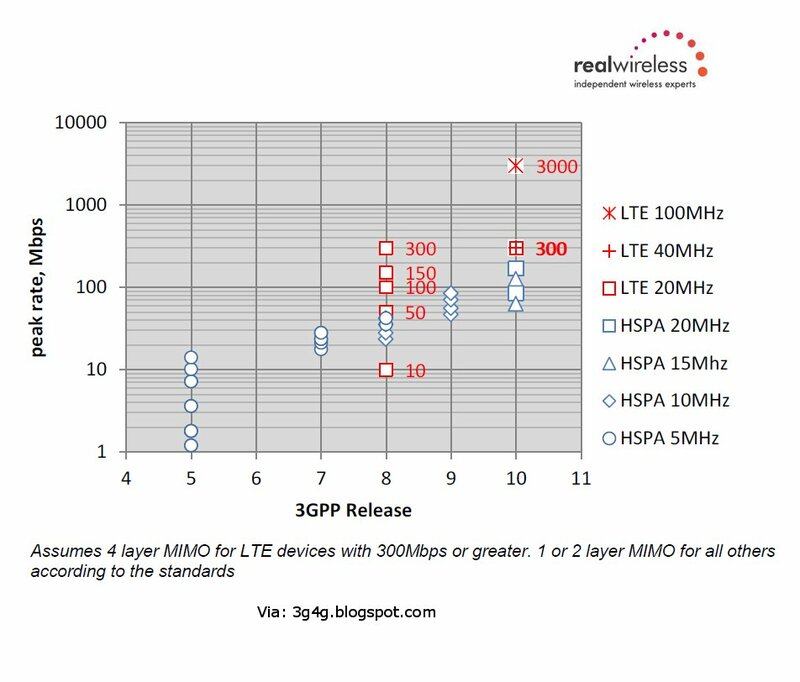 3GPP Release 9 already makes it possible to achieve 10 MHz allocation by combining two 5 MHz carriers from different frequency bands, such as one carrier on 2100 MHz and another on 900 MHz. 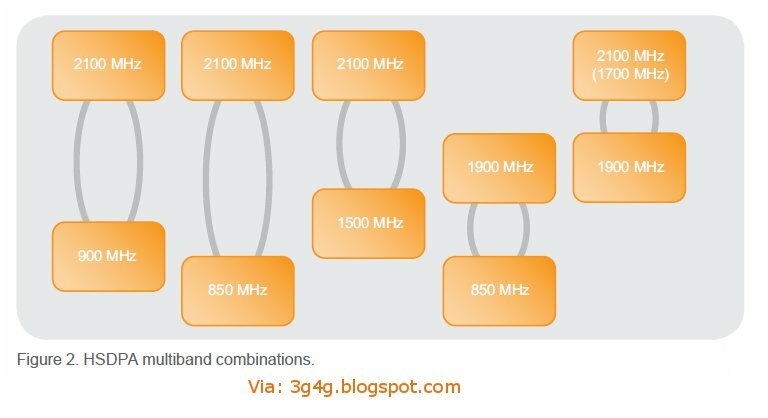 The 4-carrier HSDPA of Release 10 extends this further, allowing the aggregation of up to four carriers from two separate frequency bands. Long Term HSPA Evolution allows eight carriers. 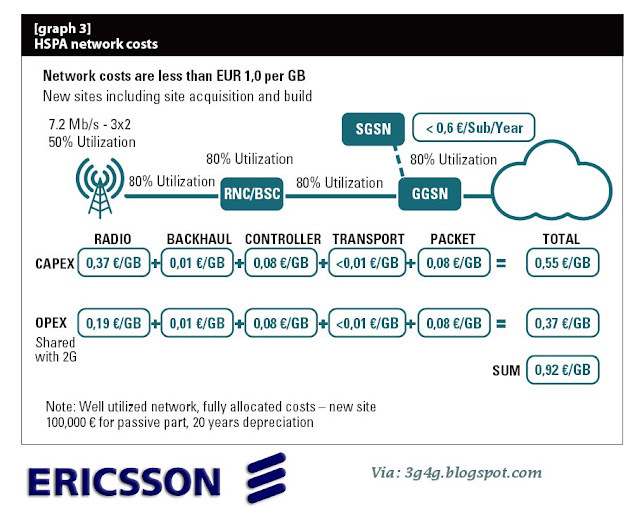 Typical cases of HSDPA multiband aggregation are shown in Figure 2. 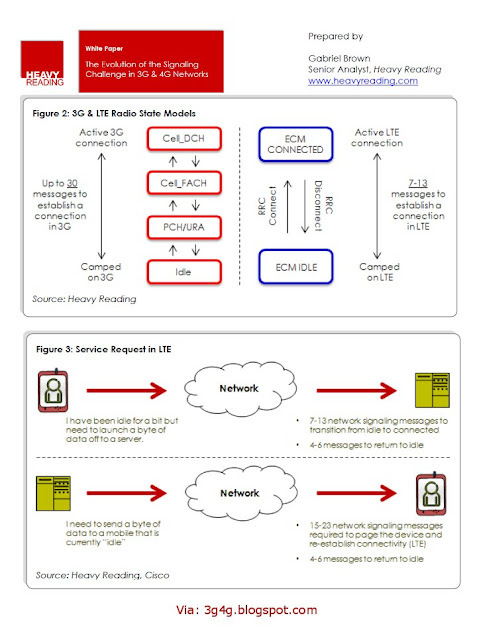 The report, Traffic Management Techniques for Mobile Broadband Networks: Living in an Orthogonal World,focuses on 3GPP networks and concerns itself specifically with traffic management, including the handling of traffic flows on 3GPP networks in contrast with other network management techniques that operators may deploy (such as offloading, compression, network optimization and other important mechanisms). 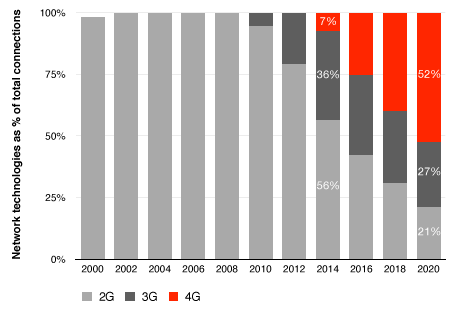 Mobile broadband networks are confronted by a number of challenges. In particular, the physical layer in mobile networks is subject to a unique confluence of unpredictable and unrelated, or “orthogonal,” influences. Moreover, mobile broadband networks have some important differences from their fixed brothers and sisters, which lead to different traffic management requirements. Among the most significant differences for purposes of traffic management is the need for more granular visibility to circumstances on the ground. Optimally, traffic management for mobile broadband networks requires visibility to what is occurring (by device or application) at the cell site level and in a timeframe that enables as far as feasible near-time reactions to resolve issues. With the consumer in mind, an End-to-End (E2E) view of mobile service is critical for traffic management. For example, a consumer using a mobile phone to look up movie listings and purchase tickets considers the E2E service as the ability to see what movie is playing and execute a transaction to purchase tickets. 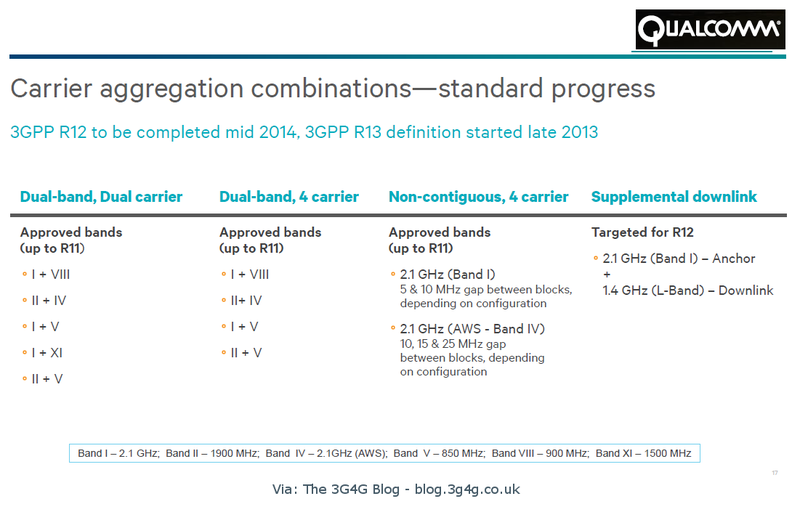 3GPP has endeavored to standardize increasingly more robust traffic management (Quality of Service, or QoS) techniques for mobile broadband networks with a consumer’s E2E view of QoS. It must be considered, however, that mobile operators typically do not have full control over E2E provisioning of services that depend on mobile broadband Internet access. Global standards organizations like 3GPP play an important role in the development of traffic management through provisions for addressing QoS, particularly regarding interworking with non-3GPP access mechanisms. These are important new innovations, and the 3G Americas white paper notes that the efforts of standards development organizations should be intensified. In addition, the configuration of end-user devices and content and applications not provisioned by the network operator not only impacts the experience of the particular user, but potentially other users in a particular cell as well. Efforts to drive further QoS innovations should be mindful of potentially adverse impacts from these sources and support and foster interoperability of third party applications with existing network platforms. More innovations are needed throughout the mobile broadband ecosystem, in particular by application developers, in order to realize E2E quality of service. Furthermore, transparency in network management practices is important in fostering innovation, but requires a careful balancing to ensure consumer comprehension while safeguarding network reliability. Organizations with technical expertise such as 3G Americas are prepared to help to illuminate and progress the development of these new technologies. The white paper, Traffic Management Techniques for Mobile Broadband Networks: Living in an Orthogonal World, was written collaboratively by members of 3G Americas and is available for free download on the 3G Americas website at www.3gamericas.org. 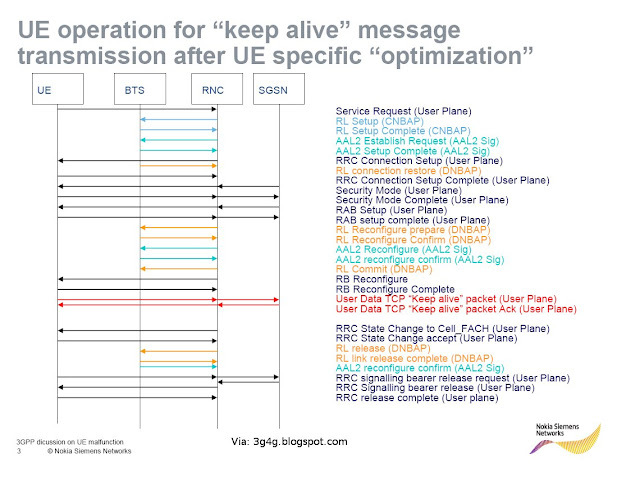 The way UMTS/HSPA is designed is that the Mobile (UE) is always in IDLE state. If there is some data that needs to be transferred then the UE moves to CELL_DCH. 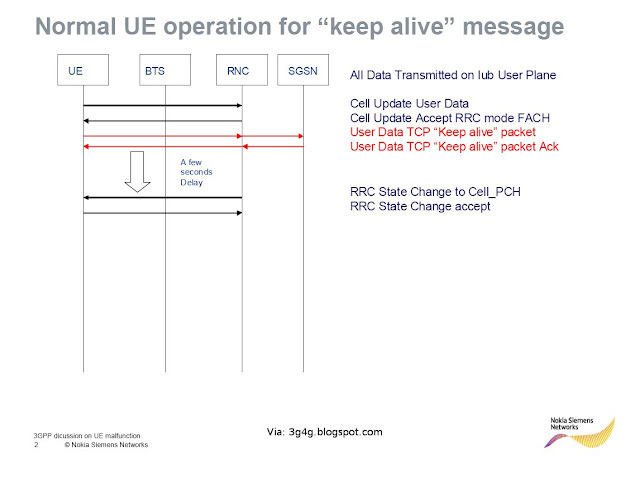 If the amount of data is very less then the UE could move to CELL_FACH state. The UE can also move to CELL_PCH and URA PCH if required but may not necessarily do so if the operator has not configured those states. The problem in UMTS/HSPA is that these state transitions take quite some time (in mobile terms) and can slow down the browsing experience. Martin has blogged about the state transition problems because of the keep alive messages used by the Apps. These small data transfers dont let the UE go in the IDLE state. If they do then whole raft of signalling has to occur again for the UE to go to CELL_FACH or CELL_DCH. In another post Martin also pointed out the sluggishness caused by the UE in CELL_FACH state. Mike Thelander of the Signals Research Group presented similar story in the recently concluded LTE World Summit. It can be seen from the figure above that moving from IDLE to CELL_DCH is 1-3secs whereas FACH to DCH is 500ms. 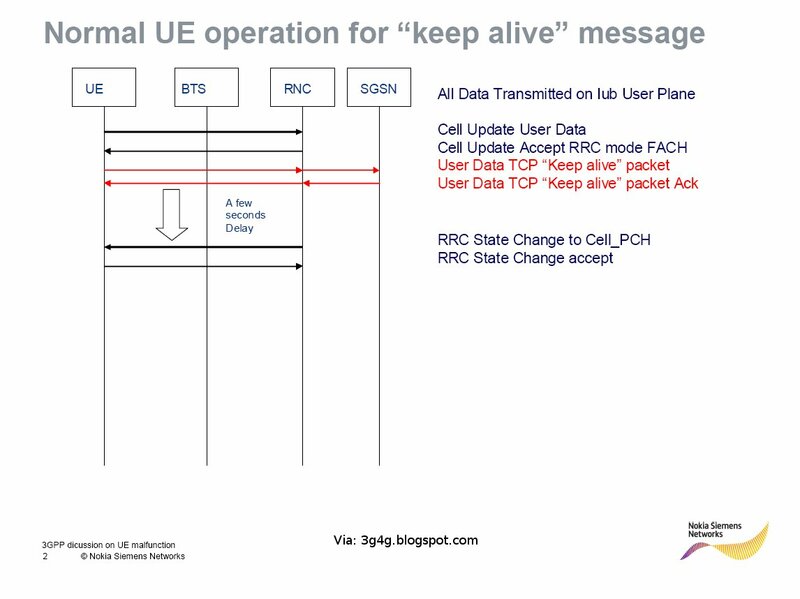 In case if some Apps are running in the background, they can be using these keep alive messages or background messages which may be very useful on the PC but for the Mobiles, these could cause unnecessary state transitions which means lots of signalling overhead. The Apps creators have realised this problem and are working with the Phone manufacturers to optimise their messaging. For example in case of some Apps on mobiles the keep alive message has been changed from 20 seconds to 5 mins. 3GPP also realised this problem quite a while back and for this reason in Release-7 two new features were added in HSPA+. 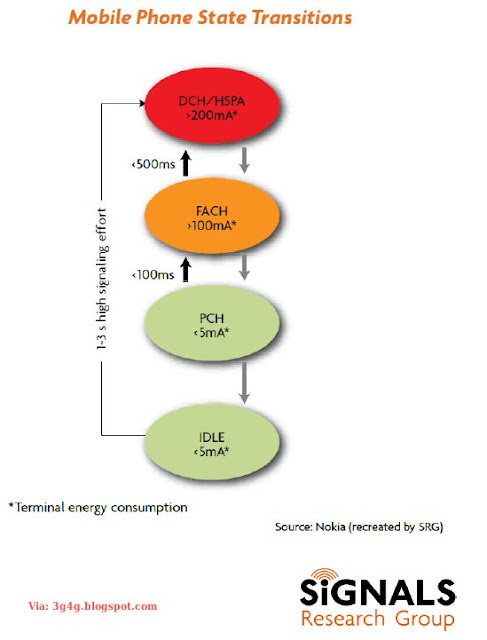 One was Continuous Packet Connectivity (CPC) and the other was Enhanced CELL_FACH. In Release-8 for HSPA+, these features were added in UL direction as well. The sole aim of these features were to reduce the time it would take to transit to CELL_DCH. Since CPC increases the cell capacity as well, more users can now be put in CELL_FACH instead of being sent to IDLE. An interesting thing in case of LTE is that the RRC states have been simplified to just two states as shown here. The states are IDLE and CONNECTED. The intention for LTE is that all the users can be left in the CONNECTED state and so unnecessary signalling and time spent on transitioning can be reduced. The preliminary results from the trials (as can also be seen from here) that were discussed in the LTE World Summit clearly show that LTE leads to a capacity increase by 4 times (in the same BW) and also allow very low latency. I am sure that enough tests with real life applications like Skype, Fring and Yahoo IM have not been done but I am hopeful of the positive outcome.